Imagine replaying and sharing all the physical fear or excitment of your last ski trip, car crash, career review, setting the office on fire (again!) , First Date or rollercoaster ride. Or imagine a hard day at the office and you just want to "chill out" - for real. My last working prototype for Microsoft Research Cambridge (before I founded www.girtonlabs.com) was BioSenseCam. As well as the SenseCam which records all life's images, movement, temperature etc, the BioSenseCam goal is to record all life's physical feelings, such as fear, excitement, pleasure etc and to replay these feelings in a human. Hot and cold temperatures are induced into your forehead or back of neck via computer control. Feelings are recorded with biomedical sensors, such as heart rate, Galvanic Skin Response (records sweat) , respiration. After recording , some of these emotions can be physically replicated, via a Peltier heat exchanger, in the person by a novel haptic device, the ThrillChip, the size of a coin. The user can watch the Sensecam video and via the ThrillChip connected to the head, the fear, excitement, surprise, etc is replicated. Head movement will be able to control the intensity of the effect. 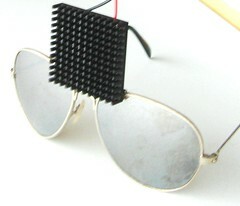 I have built an ARM microcontroller based prototype of this and it is currently in test on a subject . All SenseCam recordings capture temperature, and so you could replay your vacation movie and feel the heat on your neck, or the chill in your spine of your ski trip. Heart "bump" is replicated with another device, a haptic pedant as on right. Other applications for BioSenseCam are as a "black box" data recorder, to aid in medical diagnosis, ThrillChip applications could include possible games , Xbox, Amusement rides, etc. The BodyPower Tattoo image shows power of a few mA conducted through the skin to drive a Light Emitting Diode. Conductive silver paint is used to replace wires. This is sufficient to power an embedded microcontroller. 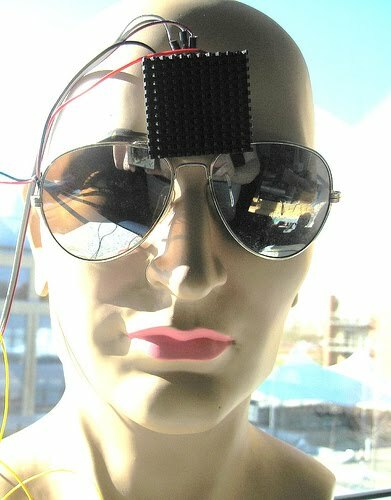 This technology may be useful for body mounted sensors where wires may tangle and be inconvenient. One example is cordless ear headphones. Here is a press release on the BodyBus , The Guardian. BodyBus concept invented by William Vablais of Microsoft Research, implementation by Lyn.